Slinky the snake is our Museum’s wonderful ambassador, semi-official mascot, and headliner of our live animal collection. You can meet Slinky and our other animals (including Sergey the Russian tortoise, Josie the rat, and some really neat insects) this Saturday from 11 am to 2 pm during our Meet the Animals program. Michelle Brannon takes care of Slinky and our other animals, and she offered to translate a blog post from Slinky to the world. So, here goes! My name is Slinky. I’m a ball python, and my species is native to parts of Africa. I’ve never actually been to Africa, but I hear it’s a pretty neat place. I was born in captivity, which means that ever since I hatched out of my egg, I’ve been handled by people. I’ve learned that people are super nice and I love to meet new ones all the time! If I haven’t met you before, there’s a problem. You absolutely MUST come visit me! I used to live in Discovery Science Center, but I’ve moved with them to the Fort Collins Museum building in Old Town Fort Collins. I have this really big new house that is just perfect for me! It would be great if you could come check it out sometime. My favorite place is under the big log in the middle, so look for me there if I’m not out on the floor meeting you face to face. As for what I’ve been up to lately, I’ve been supervising and entertaining the field trip groups that come to visit the Fort Collins Museum & Discovery Science Center, digesting my latest rat, and planning this blog. It’s been on my mind for a while now, let me tell you. I tried to type it myself, but I got a tail cramp. I’m learning how to type by using Twitter, but this blog is a bit longer than 140 characters. My human friends are helping me out this time around. Can you get carpel tunnel in your tail? I’ll have to ask my vet on my next visit. Oh, my Twitter account! You guys really should check that out. I normally update it once or twice a week (I’m a little slow, not having any hands). 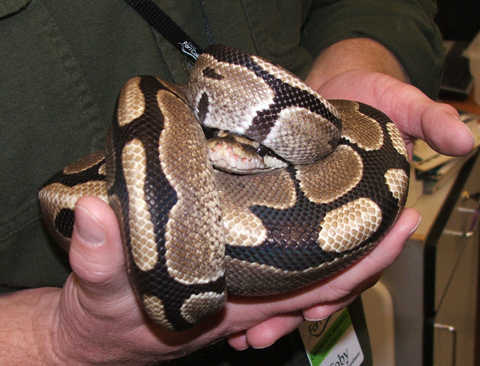 I like to talk about upcoming events at the Museum, and share amazing facts about my favorite subject, snakes. If you want to know exactly what’s going on around here, you need to follow me. You’ll also get some random musings from inside the tank, which we all know is pretty dang cool. How many of you can say you know exactly what a snake is thinking when he’s thinking it? Share the love, becoming a Slinky follower! There’s a link at the bottom of this blog that will direct you to my Twitter page. That’s about it for me. I would love to write more blogs, so if you liked this one, leave me a comment here, or send me a message on my Twitter page. Ask me questions, or just give me topics to discuss. I’m really getting into this internet thing, so if you ask, I’ll answer! Thanks for reading, and I hope to see you around my tank soon!